I had to learn how to read to my child. Me, the voracious reader... the one who reads three books at a time, the one who's only detention in my school career came because I got caught reading a book under my desk during lectures one too many times, the one who's only gift request at my baby shower were books to start LM's library ... didn't really know how to read to my child. I imagine it's not easy for any toddler to really pay attention to storytime, but for a child with SPD it's an extra challenge. I had imagined these tender moments of reading my favorite classics all cuddled up in our reading chair. Instead I was chasing him around the house or trying to keep him from tearing the pages. Luckily we had a wonderful speech therapist who was able to give me a crash course on how to successfully read to a little one, and in turn, how to instill a love for language, words and books. I'm glad to say it's been a huge success! So I'm starting a weekly La La Library post. I'll share a favorite book of ours and let you in on some of the ways we make it interesting and language appropriate. 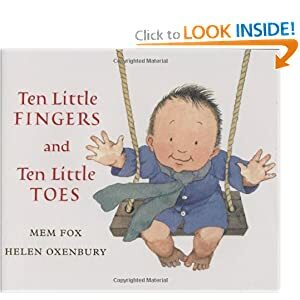 Today I'll start with an awesome list of tips by one of our favorite authors, Mem Fox. Thanks, Mem! That's a great start to our La La Library posts! Now it's your turn ... What are some favorite books in your house?? Sing and Play (and Read!) the Sensory Way! We have 2 favorites. Both come with a music CD. The Marvelous Toy, by Tom Paxto and Over The Rainbow, performed by Judy Collins and paintings by Eric Puybaret. Both are fun to read and they inspire my kids imaginations. Hi Tammy! I haven't heard of The Marvelous Toy -looks like a trip to the book store is in our future! Great article! I can relate to learning how to read to your kids-I did too! Reading & Storytelling is a great tool-not only for receptive & expressive language, sequencing skills & entertainment but also for a creative way to stimulate the imagination & teach Life Lessons. For SPD kids I use storytelling paired with movement in my yoga classes-the kids remember & process the story better if they 'feel' it in their bodies. I sometimes don't even use a book-rather, I memorize the story and then create a "picture" with movement and voice inflections. I can see when they are losing interest-and when I need to end the story. You can gradually increase the duration of attention by doing it this way, and get them to interact in the story by asking age appropriate questions: "What did they see in the forest?" "Where should they go next?" etc. You don't have to know yoga- you can "Make up" movements to go with the story as you tell it-this works with ANY Story! I absolutely love your blog-this is such a great parent resource here!